1994 Chevrolet S-10 4.3 tbi. I never get the signal to turn on the fuel pump or fire the injectors but if i poor gas in the intake once the truck starts it runs fine. Any ideas ? I have replaced the fuel pump relay oil pressure switch and computer. If you’re not getting a signal for fuel, then you either have a faulty crank sensor, or bad ignition module. But the truck runs great until you cut it off. If you poor a little gas in the intake to get it started would that only effect the starting ? Ok. If it will start by adding fuel to the throttle body and stay running afterward, then you have a bad fuel pump. Don’t understand ???? Pump runs and can drive the truck at highway speeds. Pump nor injectors work while in crank mode. User 551, let’s start from scratch. Are you checking for power at the fuel pump when you’re cranking the truck? And how do you know they don’t work? Do you have a noid light on the injectors? Well getting to start by adding fuel to the throttle body is not going to turn on some special switch that will send a signal to the pump and injectors. I’m sure you probably just have a bad fuel pump that doesn’t have enough pressure or volume to start the truck, but at running speed can keep up. Ok but I straight wired the pump and can ground the blue and green signal wire on the two injectors at will spray fuel then you can turn the switch over and the truck will run on its own . Trust me I know it makes no sense. Been turning wrenches a long time and I don’t understand it. Just can’t afford to throw money at it. That’s a new one on me. There’s no way you have no signal, but then starting the truck by adding fuel will then turn on the injectors and pump. That’s just crazy. Good luck with that one. Once the truck starts and is running you can remove the jumper to the fuel pump and it will continue to run. The only thing i can think of is that you are not getting the priming signal to the fuel pump, that the ECM if faulty. It turns over fine. Sometimes starter fluid seems to help, sometimes not? Hard to say exactly why that is happening. It could be a fuel pump that is going bad, or an ignition problem, or even a computer issue. I would recommend a fuel pressure check just to make sure it is within specs. I also asked you if the check engine light comes on at all? Sorry I missed it? No the check engine light doesn’t come on. OK it’s a good thing then that the check engine light doesn’t come on, as that would rule out a probable sensor issue. I would get the fuel pressure checked to start with, because that’s where the problem is most likely to originate from. Hey fellas I’ve got a 1998 Chevy s-10 that suddenly died on us, thinking it was the battery like AAA guy said we replaced it but the truck still wont start- might turn once then goes absolutely dead. have checked fuses, not getting any juice to the fuel pump- even tried to direct wire from battery to fuel pump and nothing. now if you pour gas into carburetor it’ll run fine till gas is gone ( i know not real smart ) but we’re not having any luck finding the ground wire either thinking maybe it was just losing ground..ive had four men look at this –any advice would be greatly appreciated. Do you mean throttle body? Your truck would not have a carburetor on it. OK that’s better. But I’m still a bit confused. You say it will go completely dead, but if you pour gas in the throttle body it will run? So it is going dead, like a dead battery, or do you mean it just won’t start, but it will crank? OK so then it’s NOT going complete dead. Have you done a fuel pressure check? Yes but there’s no pressure. Fuel pump will not kick on. So you could have a faulty fuel pump, a bad fuel pump relay, or even a bad computer. OK then that leaves fuel pump or computer. 165 Comments on "Chevrolet S-10 Truck Starting Problems Answered"
I have a 1991 Chevy S10 pickup that won’t start. I replaced the starter and it started up and ran for about 2 mins. then it shut down and won’t start anymore. No lights, not power, no nothing except the alarm when the key is in the switch. The switch has been bad at times when attempting to start but the truck would always start. All this started a few days after a snow storm. Could moister found it’s way under the distributor cap and corroded? Could it be that the spark plug wires need replacing? Could it be that the spark plugs need to be replaced? All of these have not been replaced in about 3-4 years. Replace the fuel rail purge valve and pressure sensor. Both are on plenium. my s10 wont do anything.my enigine light have been on for a year.what could be the problem? It could be a lot of different things wrong with your truck. Have the computer codes scanned first. Are you loosing spark and that is what caused it to die? Need to check fuel pressure and spark as it is dying. I have a 2002 s10 4.3 it has 150000 miles on it….it started cutting off in sept 2016 I have been replacing ingtio. Parts since..well they r all new now and now I have no power showing at the coil …I have checked all wires back to the fuse and E C M.or cumputer if you call it that. All seem to be good..
Fuel filter in the early stages thought it may. E a fuel supply issue…have since bought my own pressure gauge hold 58-62 constantly. I have 1999 S-10 starts and runs down road fine , but when stop to go into store and come out few minutes later it will crank but no start, if leave it set for bout 15 min then try starting it will fire up and run what should check fuel regulator or coil? I had same problem,I replaced the ignition switch never happened again! my battery is fully charged in my pickup but when i try to start it it just gives one click and not several clicks like a nearly dead battery. could this be a silinoid or starter problem or is something just stuck that could be easily fixed? my pickup is a 2002 chey s-10 pickup. i have a 97 s10 it died going down the road now it wont start. i have spark but no gas to injectors. fuel pump is on any suggestions? Hey Dave, curious if you fix your s10 ,or get it running. I to driving along an 98 s10 just died. I spray carb clean in throttle body an it runs ,until gas fumes run out an dies. I’m wanting to know what ,or how you fixed your problem. 1997 chevy s10/wont accelorate/but idles fine? got a 1997 s10 it starts good but its like it does not want to take the gas. Plz help!! I’m having the same problem with my 1995 s10 I replaced the full filter, fuel pump plugs , wiring and still want accelerate,it just want take gas,when you figure yours out please let me know? 2000 S10. 2.2L No start. Cranks and then starts for about 2 secs then shuts off. Have spark & fuel pressure is good. No engine light on, even durning self check. Tried using a scan tool, no communications with truck. Any help? 99 S 10 2200 chevy– ran good for three blocks, started missing and backfiring and soon quit completely I thought timing chain but it is not, so now what?? ?// Any thoughts??? I have this same issue and can’t figure it out. I have a 95 Chevy s10 2.2 4cylinder. Put a new fuel pump in fuel filter is ok , put new spark plugs and still won’t crank..
We’re you able to solve? I have very same issue. I am having the same exact problem and can’t find anyone that knows. I am in serious need of getting my 88 s10 2.5 running ASAP if you fix your problem please let me know. I have a 98 S-10 truck quit running thought it was the fuel pump changed it truck just cranks no start replaced crank sensor and still no start need help thanks. We have a 1999 s10 ls pickup 2.2l that wont start. It cranks, and after a little cranking you can smell the gas fumes. We’ve even tried engine start to no avail. replaced both coils and the ignition module, checked all fuses and relays and am about to go bald. A suggestions short of dynamite would help. 1998 s 10. 4.3 Chevrolet Times my truck fires up runs good sometimes it fires up then shuts off then then after 7 8 times it will fire up sometime I wait 3 min between tries. Hello ok 1994 s10 blazer two wheel drive bad transmission. But started and ran great! ran crappy great running gear. 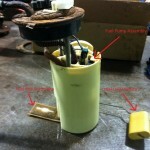 shrader valve fuel filter orings catalitic converter the spider has been re-worked new fuel pressure regulator. AND IT STILL WONT START! still wont hold fuel pressure…….WHY? My 1989 s-10 2.5 engine. Lets too much fuel into the throttle body. It’s going into the cylinders. So far I have put a mapsensor on. Changed the one and only injector,and a new fuel pressure regulator. What will fix it. I have a 2000 s10 v-6. Its had a fuel pump replaced almost 3 years ago. I had new intake gaskets and complete tune up done last summer. Today after driving it for 10 minutes I shut it off to run in the store. When I came out to start the truck it didn’t want to start. It turns over fine. It finally started and I took kids to the park for a while. Got in it to leave it started right up. Got home turned it off then tried to start it it wouldn’t start. I had my neighbor turn the key while I listened for the fuel pump to him. It sounded fine. You think its electrical? My engine light isn’t on. My hose from where you put the gas in to the tank leaks a little around the clamps when I fill it up but after the truck uses gas it stops. Any suggestions? Hoping its not the fuel pump because they are very expensive for that truck and it was replaced new within the last five years. It also just had a fuel filter replaced when I got the tune up. Having the same problem with my ’94 Chevy s10 , have replaced the fuel pump twice new relay it runs fine for a lil while then it just doesn’t want to start , next day or more it will start again! Wondering if it is some kind of overheating safety mechanism? I talked to a guy named Larry who runs J and L auto in Owensboro, Ky. He said its not electrical and if it starts and runs fine it sounds like the fuel pressure regulator that can be purchased separate of fuel pump. It had a fuel pump replaced nearly three years ago. Yes. When you turn the key on, the pump should prime for about 2 seconds. Then when cranking it should run constantly. Have the same with my 97 s10.. ..changed starter.. ignition switch . Battery .. it happens randomly .. get the clicking .. radio says bye bye .. keep turning key and sooner or later she will crank and start real fast ..everything works when i turn key on ..have played around with loose grounds.. neutral safty switch etc .. got me .. It is possible that the new starter is no good, unless this condition is the same as the reason you replaced it. If so, then you may have an ignition switch problem or a security system problem. The “:theft or security light” would be illuminated. Sounds like the fuel pump went bad. Just because you can hear the pump run does not mean it has enough pressure. Sounds like you have a low fuel pressure problem. If the fuel pump does not put out at least 55 PSI it wont start. Should I Use Factory Repacement Parts in my Car? Copyright CartruckInfo.com, Powered By JRKaz,Inc.